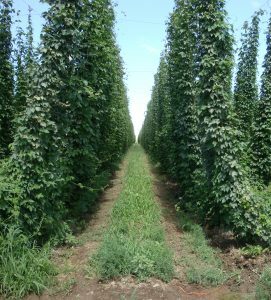 Organic hops, research trial of cover crops. Yakima Valley. Photo: D. Granatstein. It’s hard for much to make the news other than politics these days. But the world keeps on turning, we keep on eating, and growers keep trying to meet consumer demand. 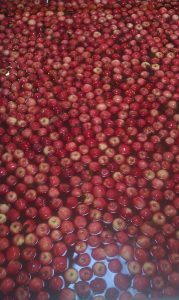 Two recent CSANR reports provide updates on organic trends – one on the organic sector in Washington State in general, and one specifically on organic tree fruit. In 2016, demand for organic foods grew once again reaching a new high of $43 billion of retail sales in the U.S. Sales grew at 8.4% over the previous year, a bit lower than the 10-12% annual growth since 2009. Global organic food sales were estimated at $81.6 billion in 2015 (the most recent year); U.S. sales made up 48% of this, with Europe accounting for 39%. Sales in Asia reached 8% and have been steadily increasing. Details on global organic trends can be found at World of Organic Agriculture . The most recent national sales summary is at the Organic Trade Association. One story that did make news is Amazon’s purchase of Whole Foods Markets in June. This could be an important new source of growth for organic foods via the expanding on-line grocery business. It could also help provide investment to boost the supply of domestic organic production. Organic food imports have skyrocketed in recent years, leading to a record $1.1 billion organic trade “deficit” in 2016. Big drivers are tropical imports (coffee, bananas), and corn and soybean for animal feed despite the fact that the U.S. is a major exporter of these crops conventionally grown. A “river” or organic Honeycrisp apples on their journey to the consumer. Yakima Valley. Photo: D. Granatstein. The biggest organic news in Washington is the rapid expansion of organic apple production. Already the state supplied over 90% of the fresh organic apples grown in the U.S. But supplies have run out in most years and there appears room for more production. Innovations in storage technology that are organic compliant, such as Dynamic Controlled Atmosphere and ozone systems, are helping to extend storage life for organic apples, which will be key to successfully handling a larger crop and to supplying markets for more months. Some companies are now able to provide nearly a 12-month supply of certain organic apple varieties. New varieties from the WSU breeding program such as ‘Sunrise Magic’ and ‘Cosmic Crisp’ exhibit particularly good storage characteristics that may be helpful for organic fruit specifically. Organic apple prices have been running 50-100% more than conventional for several years and have induced a wave of transition of orchards to organic. There could be 10,000 acres of new organic apple production in the next few years, adding to the 16,000 ac certified in 2016. Washington growers had over 24,000 acres of certified organic vegetables in 2016, another new record. The bulk of this production goes to processing, such as frozen sweet corn, green peas, green beans, and carrots. The USDA 2015 Certified Organic Survey estimated that Washington was the top producer of organic potatoes, onions, and sweet corn in the country, and was second for green peas, carrots, and other vegetables. 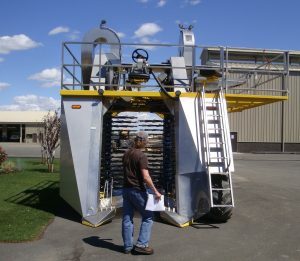 Mechanical blueberry harvester being used in central Washington organic blueberry plantings dedicated for processing. Photo: D. Granastein. Organic blueberry acres grew by another 600 acres in 2016, continuing the expansion of this crop and making the state a leading organic producer. Certified acres were an estimated 18% of all blueberry acres in the state. Much of the expansion was in central Washington. Acres of grains, beans, and oilseeds have risen sharply since 2013 and reached a new high in 2016. Wheat accounts for about 60% of this area, and was increasing in both western and eastern Washington. Acres of dry beans also took a big jump. Dairy cow numbers reached 9,000 milkers and dry cows, which was the previous high in 2008. Organic dairy cows were about 3.3% of the state dairy herd. Statewide production was about 11.7 million pounds of milk per month and has increased 70% since 2011. Washington organic milk sales were an estimated $32 million in 2015, making the state #10 in the country. The state is the national leader in organic egg production, with $87 million in sales in 2015, some 12% of the national total. The economic value of organic agriculture to the state is significant. Farmgate sales were estimated at over $600 million in 2015. If considered one commodity, organic would be the 7th most valuable agricultural product in the state. Eastern Washington farms generate 87% of the organic sales from 68% of the acres. The focus on specialty crops in the state that tend to be high value gives Washington the highest organic sales value per acre in the country – $8,694 per acre in Washington compared with $3,082 in California and a national average of $1,413. Significant additional value is generated in packing and processing. The value generated from Washington organic farms has become increasingly concentrated on farms with over $1 million in gross annual farmgate sales. These farms accounted for an estimated 85% of all farmgate organic sales in the state in 2015, compared with less than 2% from all the farms with less than $100,000 annual sales. Most of the expansion of organic production is on farms already with certified land rather than from new entrants, which is helping to drive this economic concentration. There have been political ripples that might well influence organic. One Congressman has proposed getting the government out of organic certification, which would create havoc for a period. The USDA National Organic Program is finding it difficult to finalize rule changes that have been underway for years and have broad consensus support (e.g., animal welfare) due to slowdowns on all new rule-making. Future challenges may come from various labeling changes for ‘natural’ products as well as definitions of genetically modified organisms. However, a lot more organic acres will be needed to meet industry projections of organic reaching 20% of U.S. retail food sales, up from the current 5%. More acres could come under organic management as research and grower innovation finds ways to produce organically for equal or less cost than current conventional practice. This would enable organic management without the need for a price premium, and some of the practices could generate revenue for ecosystem services such as carbon credits as those markets develop. Thus even though future market trends may be uncertain, organic systems are likely to remain as experience and analysis show that some key organic principles such as healthy soil and biodiversity can pay their way over time.